Protecting our firearms is just as important as deciding which ones we are going to own. When you invest in a gun case, you can help protect your weapon at home, when you transport it to the range, or while hunting. If you want to make safety and protection a priority, then you will want to look into purchasing a gun case for your firearm. Gun cases were designed to maintain the longevity of your firearms. They are intended to protect your weapon in a variety of settings. Two of the major areas that gun cases are optimized for is with larger stationary cases for at-home use, and gear bags and other smaller cases for travel purposes. Many of the soft travel cases for shotguns and rifles come equipped with a shoulder strap and additional gear pockets for ammunition and other accessories. Pistol cases tend to be a bit smaller and not stocked with a shoulder strap, but they do typically have a separate storage pocket for clips and ammunition. Nearly all of these cases come with a handle that makes them easy to carry like a normal bag. Some cases look more like a traditional suitcase and are not stylized after a rifle or pistol. 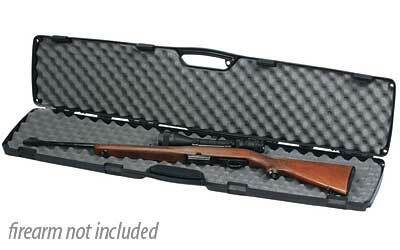 Stationary gun cases may be larger vaults or smaller safes that prevent unwanted people from accessing your weapons. Many of these can be locked and require a key or combination to enter. For gun owners wanting to increase their level of protection and security, a gun case would be a smart investment. Keep the weather and other dirt and debris off of your weapon while making it easy to transport. GrabAGun.com has a large selection of gun cases for you to choose from.